Hi friends! I've spent the day so far playing in my stamp room coming up with ideas for a class that I'm holding on January 18. It's a Stamp A Stack. If you're like me you are always in need of cards, so we will be making a variety of all occasion greeting cards. So I spent this morning coming up with ideas. The card I will share with you today is a masculine card, I am always in need of cards for guys. While I'm not sure if this card with make the cut for my class; I could use some help deciding. Nice clean card! If it doesn't make it as one of my cards for class, it will at least be good to have it in my card stash. Thanks for stopping by! 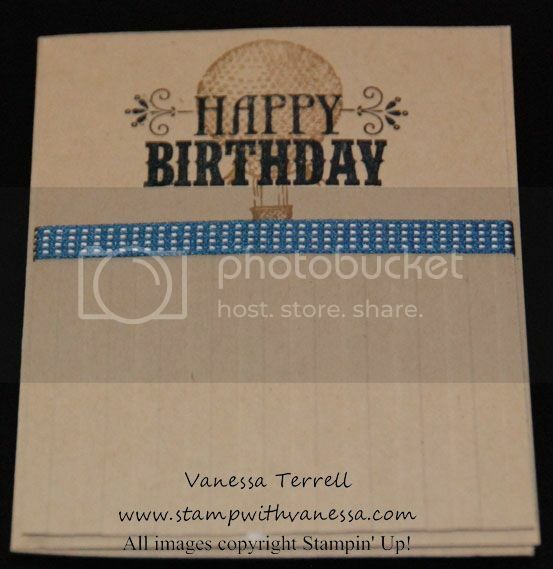 Click here to place a Stampin' Up! order. I like the steampunk vibe of this stamp. Most of my male friends are into steampunk and would appreciate both the look and the handmade quality of this card. I've always admired the folks that have the patience and the ROOM to lay out stuff and organize for stamping. It is a pretty card! Kim, thanks for your comment and for stopping by today! I like the card and I really like the ribbon you used. That stamp is a great birthday stamp. I know my guy friends would the masculinity of the card. Thanks for your comment Beth and for stopping by!